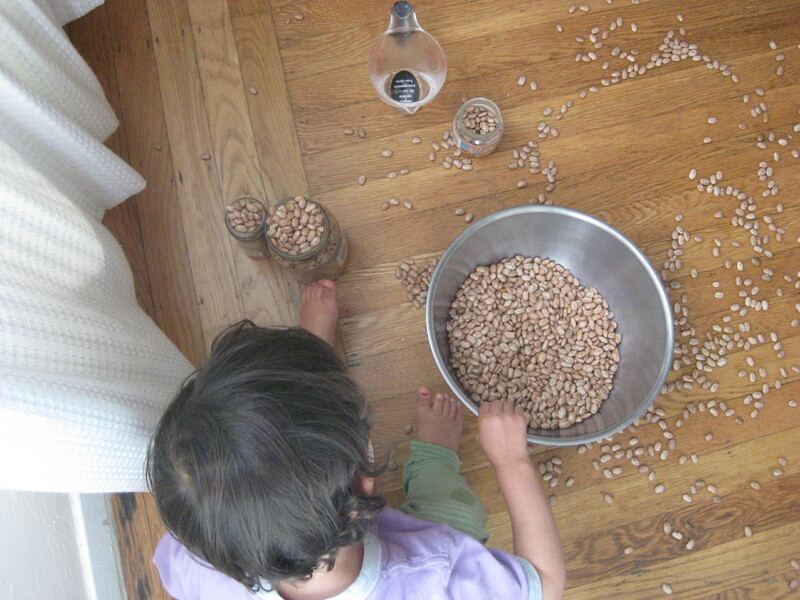 What can a little person and her mama do with pinto beans? So many, many things…over many, many days. I do want to start with the caveat that I rarely have us do art or exploration with food that won’t get eaten since a friend raised my consciousness about the message that sends about wasting food when so many children go hungry. We had an old container of pinto beans in the back of the art supplies which LP asked for which is what kicked off the beansploration. Ask for toothpicks to try and spear the beans. 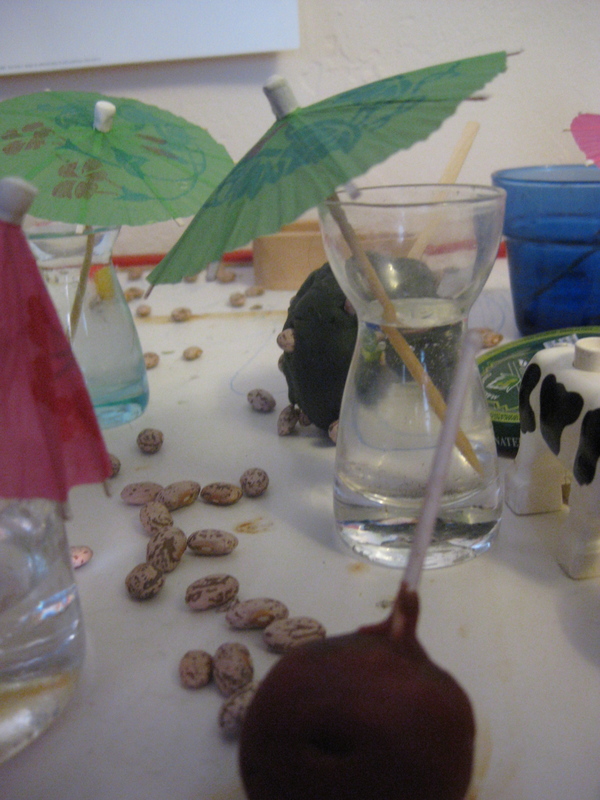 (Beans were too hard for our toothpicks so we set aside a bowl of beans in water to see how long it would take to soften them up). Set up a bean “potluck” for assorted stuffed friends. As LP’s attention was waning I wanted to see if we could extend the play by adding new elements. First in was some old toothpick umbrellas I found in a drawer. She loved them and experimented with standing them in the vases & jars both alone and with beans. Next into the mix was playdough and we made a cactus lollipop (green playdough ball on a stick with lots of pinto beans sticking out of it). We took a break for dinner and then LP returned to bean-playing (mostly setting up another potluck for her buds) until bedtime. A lot of revisiting filling up jars….my favorite new addition to the bean play involved her donkey HeeHaw (I’ve been told this toy is meant to be a horse. It was a hand-me-over and I’ve always though it looked more like a donkey so that’s what it is in our house). 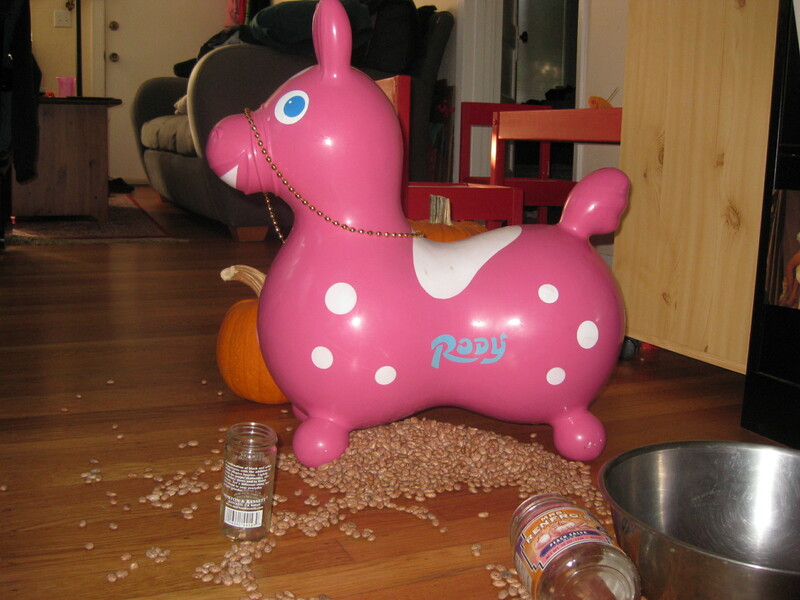 HeeHaw got a bean shower and then the pile of beans became her babies and she nursed them for a long, long time. After all the bean hunting to clean-up, I was ready to retire the beans for awhile. So off to the compost for the beans that had been in her mouth (or in particularly dusty places) and back to the container for the rest. The bean pile is dwindling but I think there’s at least another day’s play in it. It has been fun to watch all of her spontaneous creations and also it has been wonderful independent play!